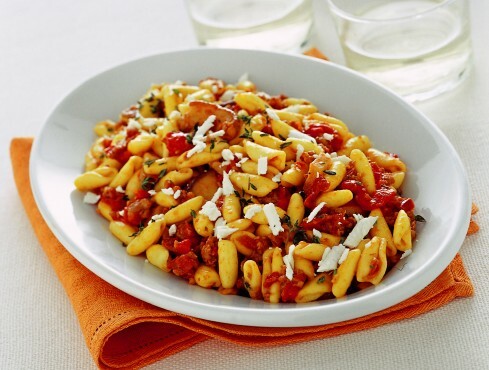 Cavatelli is a traditional southern Italian pasta shape which pairs well with thick, chunky sauces like this one. This is a filling, tasty and quick recipe using several southern staples. Soak the Porcini in warm water for 20 minutes. Chop the sun dried tomatoes into pieces. Next, warm 4 tablespoons extra virgin olive oil in a non-stick pan, add the chopped dried tomatoes and fry gently for a few minutes. Then add the peeled and crumbled sausage meat and let it cook for 4-5 minutes, checking and turning it frequently. Add the wine, cook on a fairly high heat until it has evaporated. Add the Porcini, salt and thyme, put the lid on the pan and leave to cook on a low heat for 15 minutes. Cook the Cavatelli in plenty of boiling salted water, draining when still al dente. Add the pasta to the sauce and, stirring gently for a few moments to allow the sauce to stick well to the pasta. Garnish with a little Ricotta cheese (optional) Serve whilst nice and hot. Buon Appetito!